Had one flash to the front and one to the to the side towards the back. Thanks so much, you guys. For the smashing score, the votes, faves… and the ribbon!! Just joking...beautiful photo Irene. Well deserved ribbon! Perhaps more time in the barn is what you need afterall, pointandshoot. Message edited by author 2009-09-26 22:04:20. If I could do this with paper I'd spend more time in the kitchen and less time in the barn. Congratulations, Irene. Oh Irene, I just love waiting to see what you come up with. Such an incredible imagination and such talent! Congratulations! Great colours and idea, how do you come up with them. Congratulations on your ribbon Irene! As is customary with your work, Irene, splendid image. Always a pleasure to see it on the front page. Great choice on the complimentary colours Irene. thought this was yours I sooooo look up to you. Awesome job, yet again! This has such a great feel to it!! Love your color choice. Great image Irene. You come up with such great ideas for the challanges then execute them beautifully. Congrats on your ribbon!! Love the colors. 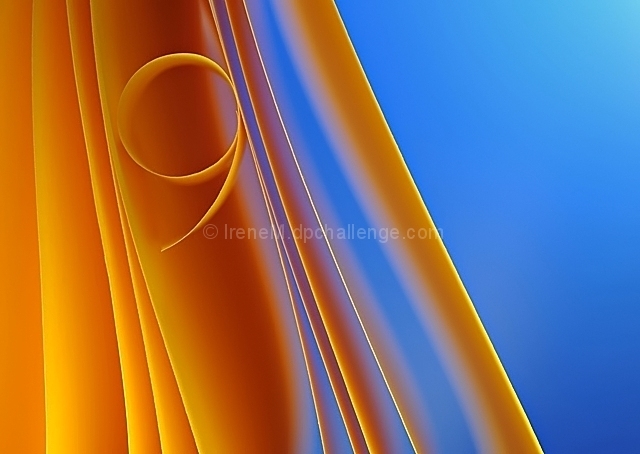 Irene, this is such a beautiful work! Big congrats on the yellow. As always, beautiful work! I love the colours! Congrats on yet another ribbon! Irene, your shots are unmistakeably you! Wonderful composition, lighting and colors. Nicely done. Well done, this was my favourite. I think soon they will have to create a "Page 2" for ribbons for you! Congrats! Beautiful colours and excellent lighting. Congrats on the yellow. Ich bin immer wieder beeindruckt von Deiner Arbeit! i love your imaginative take on the challenges and the way you are able to create the most stunning images ..
you might run out of room on your profile page for all your ribbons .. !!! Great colour choices Irene. Congrats! Congratulations! Excellent image with nice colors & DOF! Great job Irene,and congrats once again. I was debating with Daniel that this was not yours !! Well I was wrong. Huge congrats again on a great shot. Great work, lovely colors, Congrats!! Predict a ribbon for this one. Nicely done. The focus is dead on. Complimentary colours work well. Composition is good. Lovely picture to look at. I love how you've tucked the number into the lines and blurs. Beautiful combination of colors. Im going to say that this is probably a sure winner. Great idea, great shot. You can never go wrong with complimentary colors like that. It should be a winner. It is so much better that everything else in this challenge. Looks Irene's. How do you light it? very abstract and cool looking. Clean, Sharp, great background - This is beautifully done! Just breathtaking. Worth the work and hopefully a ribbon! very cleany work, creative idea, beautiful color. a winner in my eyes! - I asked my self: Irene, is it yours? Fabulous colors. Subtle but effective "9". Love the colors and gentle lighting in this one. This is neat. Great idea, colors, lighting and comp. Irene, U have done it again. Fantastic image. U r gonna ribbon again. :) 10 from me. Nicely done, on the most genuine IreneM's stype. Proudly hosted by Sargasso Networks. Current Server Time: 04/21/2019 02:38:11 PM EDT.